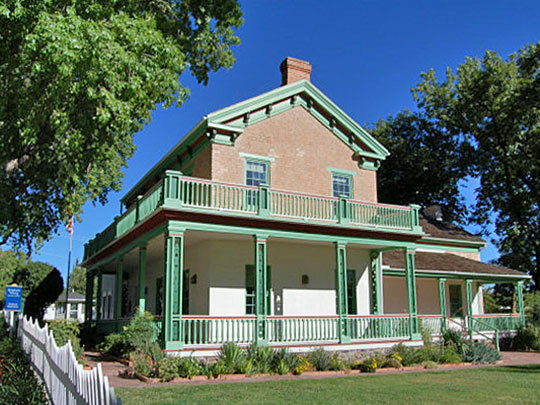 St. George City Hall is located at 175 E. 200 N., St. George, UT 84770; phone: 435-627-4000. Photo: Brigham Young Winter Home and Office, ca. 1871, Corner of 200 North and 100 West, St. George, UT. Listed on the National Register of Historic Places in 1971. Photographed by user:RJHall (own work), 2005, [cc-by-3.0 (creativecommons.org/licenses/by/3.0)], via Wikimedia Commons, accessed August, 2013. St. George is marked by the white Mormon Temple, which rises dazzlingly above red soil, green trees and lawns and trim red houses of adobe and brick. The seat of Washington County, St. George stands at the heart of Utah's Dixie, and is known for its long hot summers and mild winters. The story of St. George's founding has an epic character. The success of cotton-raising experiments induced Church authorities in 1861 to undertake large-scale colonization of extreme southern Utah. Even then the area had a reputation as a hard place to live and those "called" to the Dixie mission "to sustain Israel in the mountains," in many instances were not happy about it. One father, coming home from a hard day in the fields to be told that he had been "called" to Dixie, sank into a chair. "Damned if I'll go," he said. After sitting a few minutes, head in hands, stood up. "Well, if we are going to Dixie, we had better get ready." Robert Gardner, notified that he was selected and expected to go right away, "looked and spat, took off my hat, scratched my head, thought, and said, 'All right!'" By December 1867, more than two hundred wagons were on the site of St. George and the "town" was two long rows of wagons facing each other, with a ditch between. Before there was a single house in it, St. George was an incorporated town. Crops failed year after year while heat, sand and wind rasped at the nerves of the colonists. Visiting St. George in 1870, Orson Huntsman observed, "I believe we were close to hell, for Dixie is the hottest place I ever was in." The colonists, however, stuck to their task, growing cotton and fruit and, in the seventies, experimenting with silk. Erastus Snow was the apostle designated to build up Dixie, and if life was hard for him and the other men, it was heartbreaking for some of the women. David Cannon's young wife, living in a willow lean-to in place of the luxury she had known, told her husband that if he could find just one flower fit to pin on a lady's dress, she would try to be satisfied. In the spring he presented her with a bouquet of orchid-colored sego-lillies, and she thought them as beautiful as any flower she had ever seen. Polygamists were hunted by U.S. deputy marshalls in the eighties, and while warnings passed on from Silver Reef were helpful, the polygamists led a grim life. Charles Walker wrote in his journal during May, 1888, "This month and part of April I have been obliged to hide up from the U.S. Deputies who are seeking me night and day to arrest and drag me to prison for obeying the commands of God my Eternal Father ... They summoned my wife and daughters to Beaver, 120 miles distant, to testify against me. And this in a Christian country where everyone has the right to worship God according to the dictates of his own conscience." The difficulties over polygamy passed in the nineties and St. George settled down to agricultural development. The lack of railroad facilities made high freight rates a serious handicap, but the improvement of US 91 as an arterial highway opened truck routes to Salt Lake City and the Pacific Coast. With the rise of tourism, St. George's position half-way between Salt Lake City and Los Angeles, and as a point of departure for nearby scenic wonders, revitalized the town. In 1940 it is a brisk town, flavored by its romantic past, sitting warm under the sun. The large white "D" on a black ridge flanking the town is emblematic of Dixie Junior College, founded in 1911 as the L.D.S. Dixie Normal College, and given to the State as a junior college in 1933. Workers of the Writers' Program, Works Progress Administration, State of Utah, Utah: A Guide to the State, American Guide Series, 1945, Hastings House Publishers, New York.